I can’t hardly keep up with myself. The past four out of five weeks, I’ve been somewhere on a trip. I have SO much to write about for you! Expect a whole lotta catching up in the next few posts! First things first, last Sunday I was amongst the stars at The Shrine Auditorium in Los Angeles. The good folks at GM/Cadillac brought along a very select, small group of bloggers to experience the BET Awards in person, and I was blessed to be in their company. There’s something absolutely magical about being at something so star studded. I looked and felt good, we had seats with a great view of the stage, and I thoroughly enjoyed myself all night long. 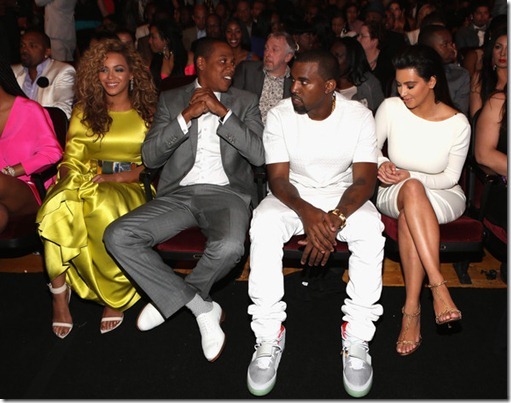 Let me tell you my top five favorite moments of the 2012 BET Awards! How does it FEEL? It felt AMAZING on Sunday night! 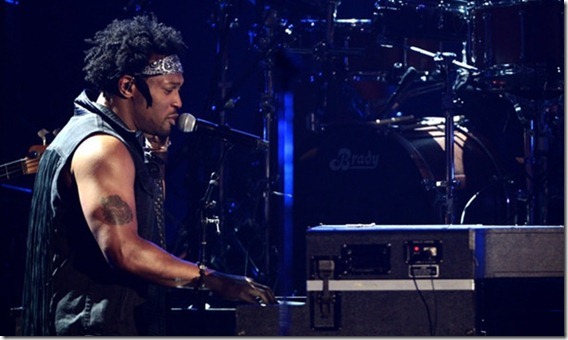 D’Angelo has always been one of my favorite musicians, period and from the minute he took the stage it was obvious and apparent that he is BACK to show us all how it’s DONE. 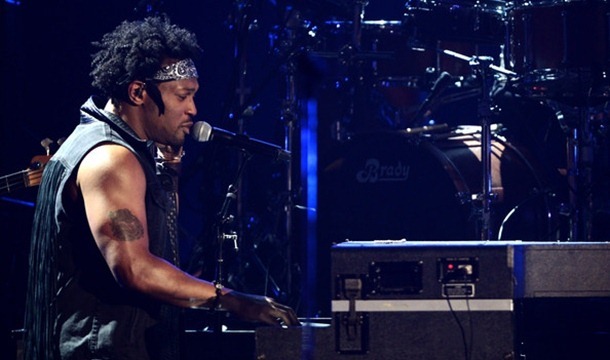 D’Angelo started with Untitled (How Does It Feel) and made the crowd quake with a new track, just to let us all know there’s much more in store. And I get to see him tomorrow night at Essence Fest? SO BLESSED! SO EXCITED! He is gonna KILL it. Their music has provided the soundtrack of summer and cookouts and good times for 40 years, and finally the legendary soul men of Frankie Beverly and Maze were honored with the Cadillac Lifetime Achievement Award. I absolutely LOVED Frankie Beverly’s speech, in which he advised the audience of younger artists to follow their hearts. “Don’t fall for the flavor of the week, baby.” SAY THAT, Mr. Beverly! Frankie Beverly and Maze then took the stage, and while tweets complained about rough vocals, I was so mesmerized by the experience that it was perfection to my ears. Joe, Tyrese, and Faith Evans paid them musical tribute as well, and lest anyone forgot the flawlessness of Faith Evans’ vocals, let this performance serve as a reminder! The moment so many of us were waiting for didn’t disappoint. Many of Whitney’s closest friends and family came together to create this, so that alone made the moment special. Monica set the tone with gospel. Brandy channeled Whitney with two of her most danceable hits. Gary Houston remembered his sister with words and song. 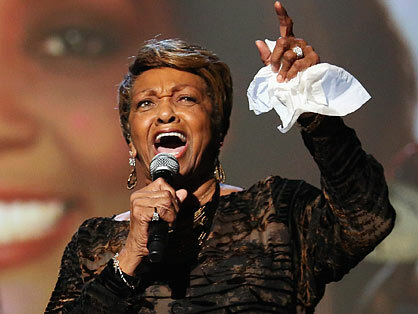 Cissy Houston’s aching version of Bridge Over Troubled Waters brought the tears for me. Her first lyrics gave me chills all up and down my arms. By the time she sang “sail on, silver girl,” I was practically weeping. And then Chaka Khan brought the mood back up with I’m Every Woman. It was LOVELY. I was honored to be there in person for this. The emotion filled the room. I hope BET does even more at some point, maybe a full hour long concert tribute to Whitney, featuring her nearest and dearest? Even though it was amazing, I yearned to hear from Mariah, Kim Burrell, CeCe Winans…I think that would be so incredible and so beloved by her fans. We still miss you so much, Whitney. The tears throughout the audience proved that, for sure. Where I sat, it was a perfect bird’s eye view of the front rows of the audience. I haven’t yet watched the full telecast of the show, but I will say this – the front row of Solange, Beyoncé, Jay-Z, Kanye, and Kim Kardashian seemed to have much more fun when the cameras weren’t pointed right at them for any signs of reaction. It seemed to me like everyone had fun and enjoyed each other’s company. But like I said, I haven’t watched the telecast yet. There’s something very humanizing about seeing musical, television, and film stars in person. Just seeing how differently they might look from the screen to real life in terms of height, stature, social interraction….it’s fascinating. It would be so crazy to be famous on the Beyonce, Jay-Z, Kanye, Kim level. Like, SO crazy. I don’t think I’d like it. I don’t think I could handle it. Even though there are so many amazing opportunities that come with fame, your privacy becomes nonexistent and you pretty much live your life under a microscope. I don’t think I’d do well under those circumstances. Something about this trip made me very philosophical about fame and what it means. I might have to write a separate post about this. Stars, they really ARE just like us! In some ways. You know what I mean? If you’ve noticed anything about my musical taste, its probably that I LOVE great vocals. I don’t even really care what genre of music you sing. Rock, reggae, pop, soul, gospel, bring it on if you can SING and give me life with your voice. The women of Sunday’s Best had the whole crowd grooving to their version of The Clark Sisters’ You Brought The Sunshine. It was awesome. Click here to watch. And when Yolanda Adams won her BET Award she took the opportunity to reach out to the artists present. “Please make sure that you use your gift responsibly, ’cause we’re watching. Our babies are watching, and they want to be like us,” she said. I hope she reached at least a few. There were other parts of the show I really enjoyed, like Nicki Minaj’s performance (Beez in the Trap goes so hard on the elliptical trainer)!, Beyonce’s gracious speeches and gorgeous gown, and the whole hilarious Real Househusbands of Hollywood segments. I had a great time on Sunday, and I was honored to be there. Thank you Cadillac for bringing me along, and thanks to my glam squad for helping me turn it all the way out! Did you watch the 2012 BET Awards? What was your favorite part? « What I Wore During BET Awards Weekend in Los Angeles! Brandy KILLED it for me. Her vocals were on point and it was nice to see all the celebrities digging her performance. I loved Brandy but Monica’s vocals are sick. I also love the little moment with Jay and Bey when they were up for best video together 2 videos that was so cool…. The Whitney tribute had me crying all over again too. I loved seeing the connection between Beyonce and Jay Z. Couldn’t watch the Whitney tribute to the end, was just really sad. Love your nails the best! Really enjoyed reading your tweets during the award show!